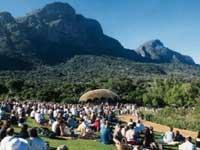 The Kirstenbosch Summer Sunset Concerts are idyllic experiences set beneath the gorgeous expanse of the mountains. With a picnic and a glass of wine, audiences can listen to a mixed selection of classical and contemporary music. The gardens themselves provide one of the most spectacular concert venues in South Africa, with the stage framed by the backdrop of Table Mountain and sprawling flowers of the Kirstenbosch National Botanical Garden. In fact, National Geographic voted this exquisite floral wonderland as one of the greatest places in the world for a picnic. One can only imagine the atmosphere generated when international artists like Michael Buble, The Lumineers, and Paolo Nutini take to the stage. For a full programme of who is performing, check out the official website. Ticket prices range depending the artist. As there are no assigned seats, it is a good idea to arrive early to set up a good spot near the stage and enjoy a stroll around the beautiful gardens before the show begins.